A review of the latest cruiser delivered from the Cheoy Lee shipyard, Captain Richard Thiel is onboard the new Alpha 87 Sportbridge. The first thing I noticed when I stepped into the expansive saloon of the Cheoy Lee Alpha 87 was the name Recaro. It was embroidered into the headrests of the three helm seats, just forward of the eight-person dining table, and it hinted at what I was about to discover about this boat. Recaro, as most everyone knows, is famous for the custom seating found in most of the world’s top performance and race cars. 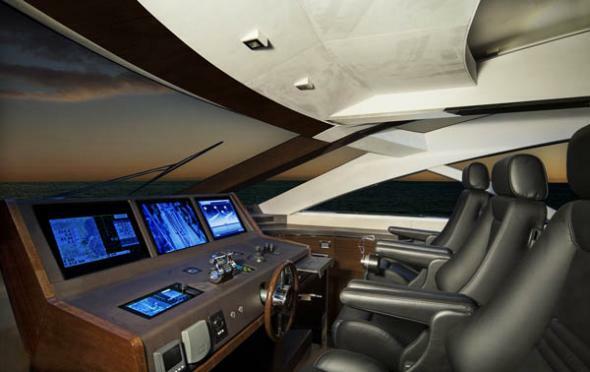 But beyond that, when’s the last time you saw three individual helm seats on an 87-footer? Clearly the reason they’re there is that they tell you this boat is about performance, and everyone is going to want to be in on the action. The seats were not just there for show either. 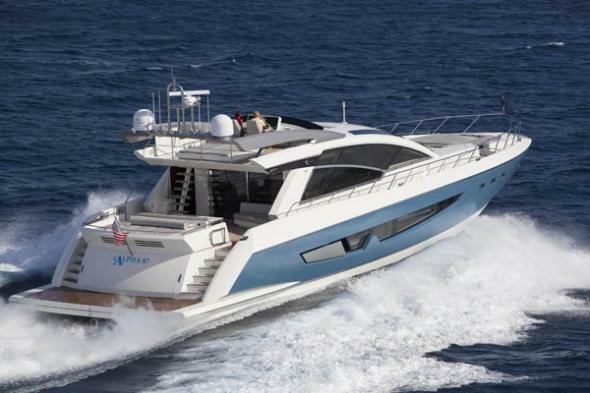 Powered by a couple of 1,925-horsepower Caterpillar C32 ACERTs, our test boat put up some impressive numbers: a top speed just a tick under 31 knots and 26.5 knots at a moderate 2000-rpm cruise setting. Frankly, those are what you’d expect out of a pair of considerably more powerful engines. How do Cheoy Lee do it? For starters, they began with a hull designed by Michael Peters, who’s drawn more than a few fast boats in his time. One of the characteristics that impressed me about this particular fast boat is its relatively moderate running angles, even during aggressive acceleration. That’s not the norm in a V-drive vessel that puts the weight of those big motors all the way aft—and I do mean all the way. 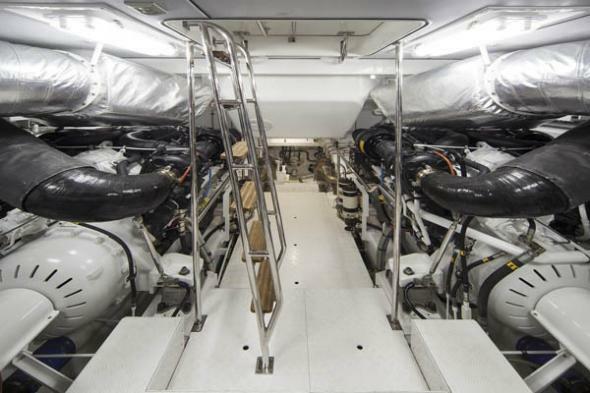 Unlike most boats of this size that site the crew’s quarters abaft the engine room, the 87 has them forward of it. Indeed, the engines are right under the cockpit sole. 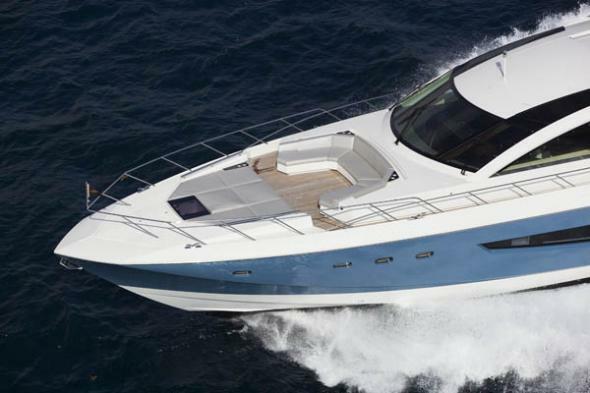 An aft-engine configuration is widely recognized as being optimum for a planing hull as it allows more of the running surface to uncover, reducing hydrodynamic drag. But in a motoryacht it carries with it another benefit. 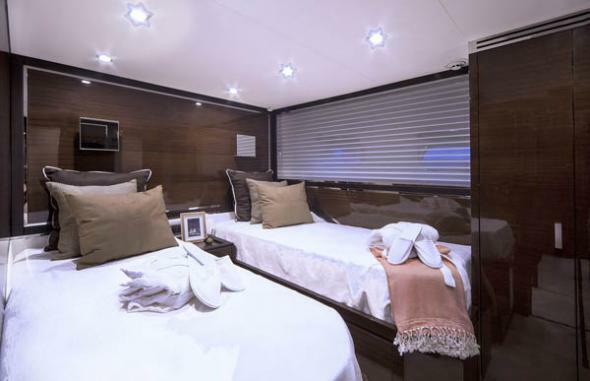 In a typical layout with the engines forward, the owner’s stateroom—or more accurately, the owner’s head—lays up against the forward engine-room bulkhead, necessitating either the extensive use of sound-deadening materials or the acceptance of higher sound levels in this important living space. 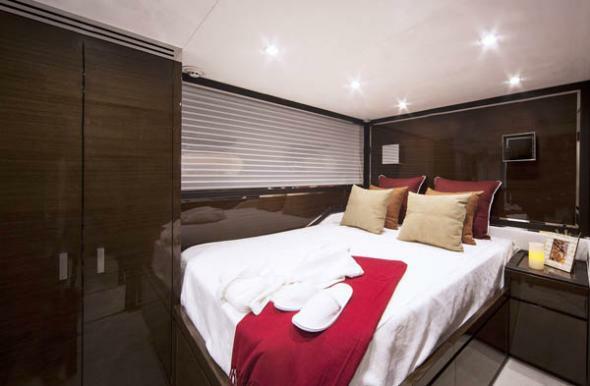 In the 87, the full-beam crew’s quarters provide the acoustical buffer. Any increase in sound levels there is of little concern because the crew so rarely occupies this space while the boat is underway. On the other hand, the owner’s stateroom, still buffered by a large head and walk-in closet, is whisper quiet at speed. But back to performance. 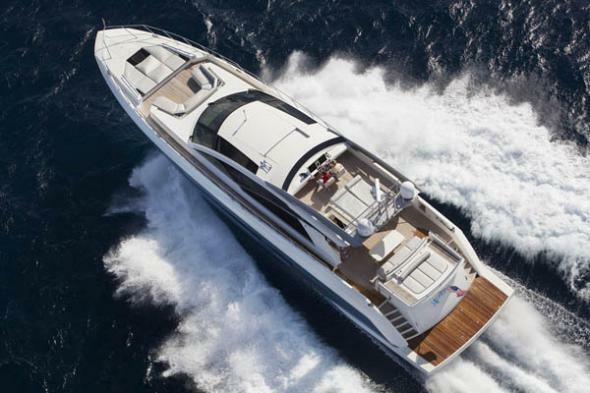 There’s another big reason why the 87 so deftly tops 30 knots: her moderate displacement. 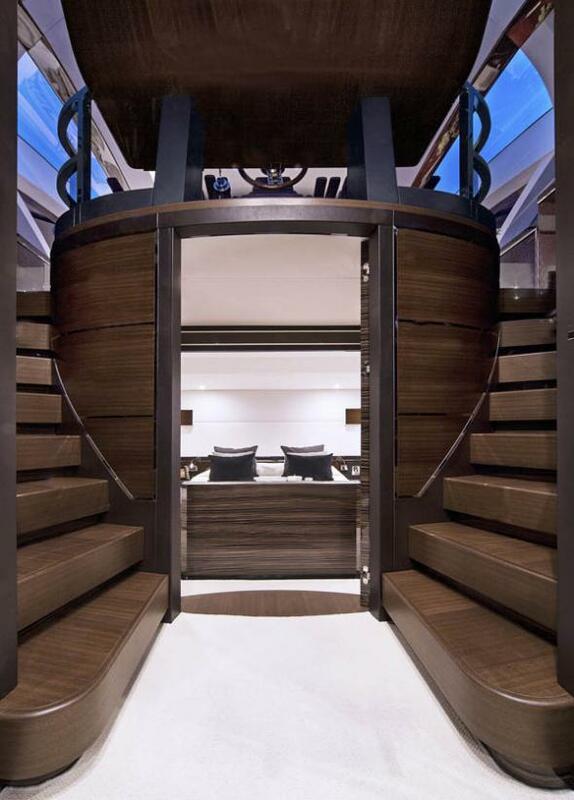 The lamination specifications include all of the latest weight-saving technologies: resin-infusion utilizing carbon fiber and E-glass, a hull bottom cored with high-density foam, and foam-cored superstructure, decks, soles, and bulkheads. (The goal, it should be noted, is not only saving weight but also lowering the center of gravity.) But for Cheoy Lee, a list of materials provides only a starting point for our story. At this point it may be helpful to recap Cheoy Lee’s history. Established in 1870 and in continuous operation since then the shipyard over the years has produced not only sail and power yachts but also scores of ferries, patrol boats, harbor and offshore tugs, and pilot boats. (Today it’s also well known for its Z-Tech 6000 harbor tugs, which have 360-degree azimuthing pod drives. See “Panama Rising”) Customers of all stripes are drawn to this Chinese yard not to save money but because of its reputation and engineering expertise. In the case of the 87, that expertise is reflected in what you think you see but actually do not. 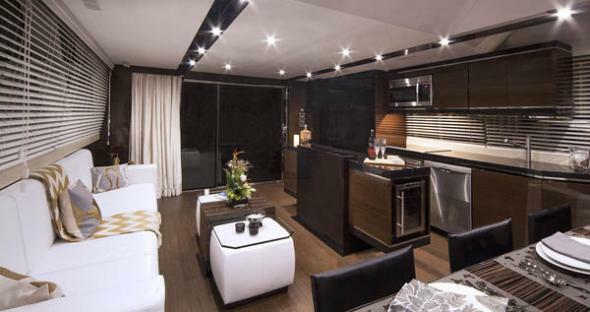 The vessel is as profligate as any other luxury yacht when it comes to the use of expensive hardwood, granite, and marble. The difference is that on this boat nearly all of those materials you’re admiring are veneers—in the case of marble, 4-millimeters thick. (This allows the marble in the master shower to be book-matched.) In nonstructural uses the laminate is backed by composite or aluminum honeycomb. But in other instances, it is vacuum-bagged to high-density foam. The beautiful wood sole is actually a veneer that has been vacuum-bagged to high-pressure laminate and foam off the boat, then brought aboard and vacuum-bagged into place. Even the cabinetry is veneer over honeycomb. 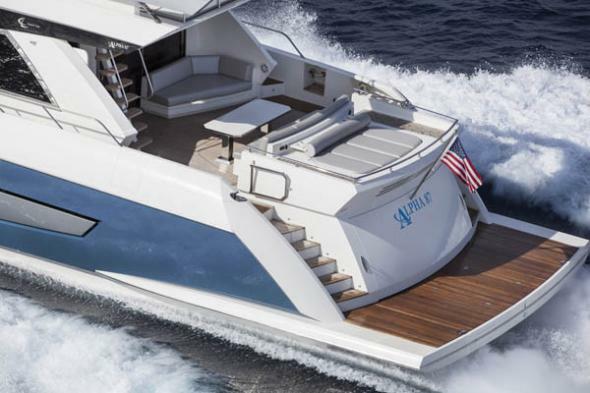 Extensive use of such weight-saving technologies produces a boat whose luxury is the match of any yet weighs significantly less: 153,200 pounds, per the spec sheet. How much less is that? The answer is elusive, but one estimate I got from Cheoy Lee Alpha project manager Gene Weeks of 20,000 pounds less seems credible. And note that this boat’s scantlings have not been compromised to trim her displacement. A beam of 21 feet 7 inches is as much as two feet wider than some comparable vessels, producing both a generous saloon and eminently workable side decks. Also not compromised are the engineering details you’d expect to get from an experienced shipyard. Take the standard sunroof, a nifty piece of design that somehow fully retracts into the flying bridge to maintain that sleek profile. And sleek it is: viewed from the side the flying-bridge helm is all but invisible, yet it offers excellent sightlines. Another smart piece of design is the 87’s modularity. 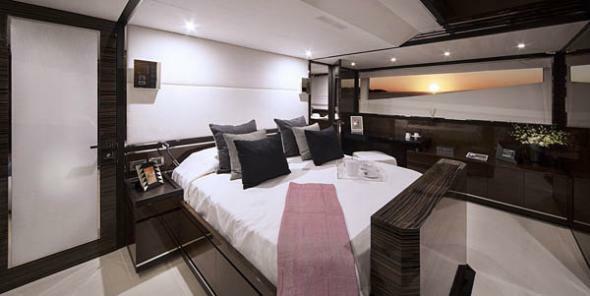 Many interior and exterior features, like the aft spa and cockpit bar and the foredeck seating area, are built as stand-alone modules, a feature which gives the prospective owner great latitude in customizing the layout to suit his or her needs. Not so visible but every bit as important is the 87’s sea chest and common drain system which reduces through-hulls to the bare minimum. But everyone will notice how elegantly the Bruce plow anchor nests into the stem. The engineering by which this is accomplished without human intervention would take pages to relate. On the other hand the basic philosophy of the Cheoy Lee shipyard can be succinctly summarized: Whether it will be pushing ships around a harbor or taking a family on the voyage of a lifetime, create a boat that’s strong, safe, efficient, and built to go to sea. And if she can do so at almost 31 knots, all the better. 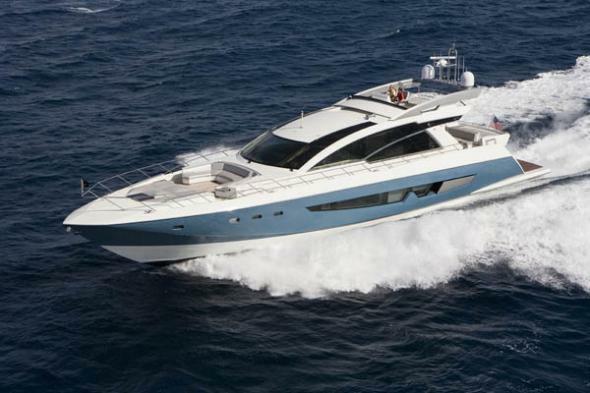 This article has been reproduced from the Power and Motoryacht website.